The beauty of cacao nibs is that they are so rich in flavour and add crunch, oh and did I mention they are good for you? Raw cacao contains more antioxidants than blueberries, red wine and green tea. Ice cream used to be my favorite treat, but since cutting out dairy ice cream was one of the first foods to go. It wasn't easy. Since perfecting almond milk ice cream, and now this chocolate chip banana whip I am more than content with my dessert options. 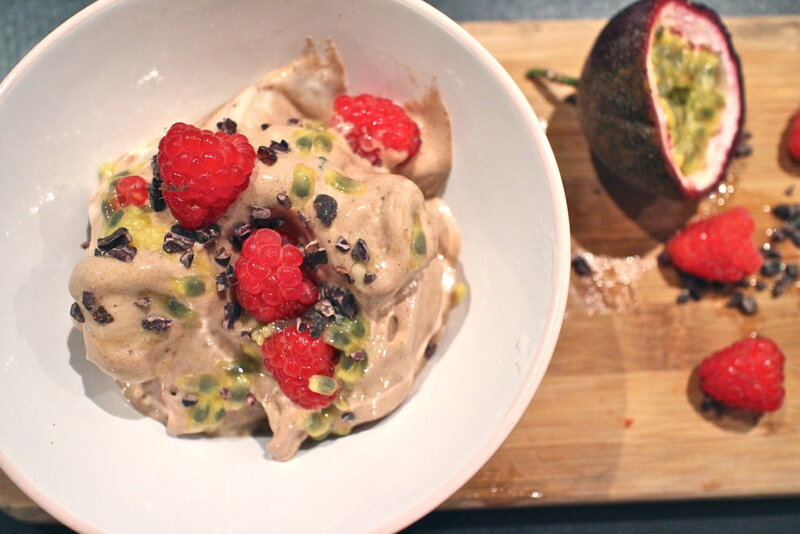 Put bananas and cacao into a blender or food processor. Blend until the bananas and cacao powder have mixed and are a whip/ice cream like consistency. Take out of blender/food processor, put into serving bowl and mix through cacao nibs. I served mine with fresh passionfruit and raspberries. Also delicious with fresh strawberries and blueberries. This was enough to serve two people so add more bananas to make a big batch and you can store leftovers in the freezer.